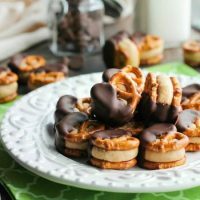 Peanut Butter Pretzel Bites - Dessert Now, Dinner Later! 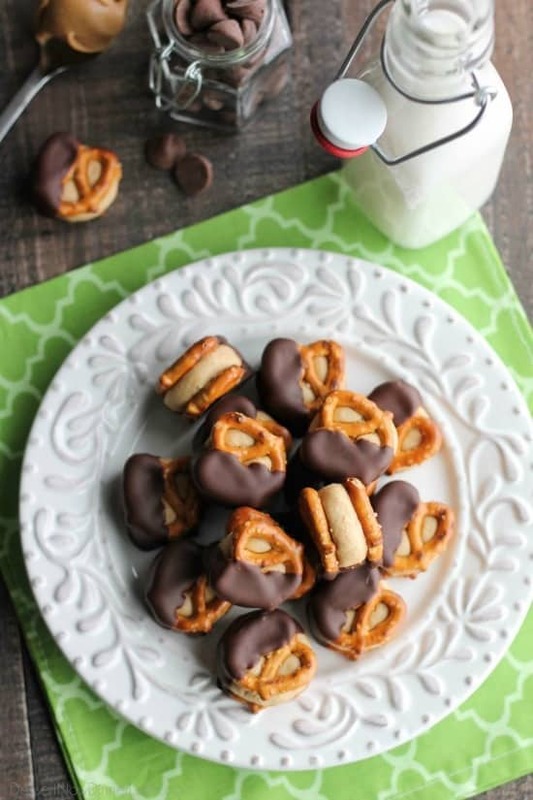 Peanut Butter Balls are made into pretzel bites for a salty-sweet addicting treat! Perfect for parties or Christmas neighbor gifts! If there is one iconic holiday treat that I like to make every year, it’s peanut butter balls, a.k.a. buckeyes, or whatever you want to call them. They’re basically homemade Reese’s Peanut Butter Cups in ball form, but better. For non candy makers like myself, peanut butter balls are the easiest way to pretend you know what’s up in the Christmas candy making department. They are, dare I say it … foolproof! I was thinking about those peanut butter balls, and I wanted to add a twist to them. So I added pretzels and voila! 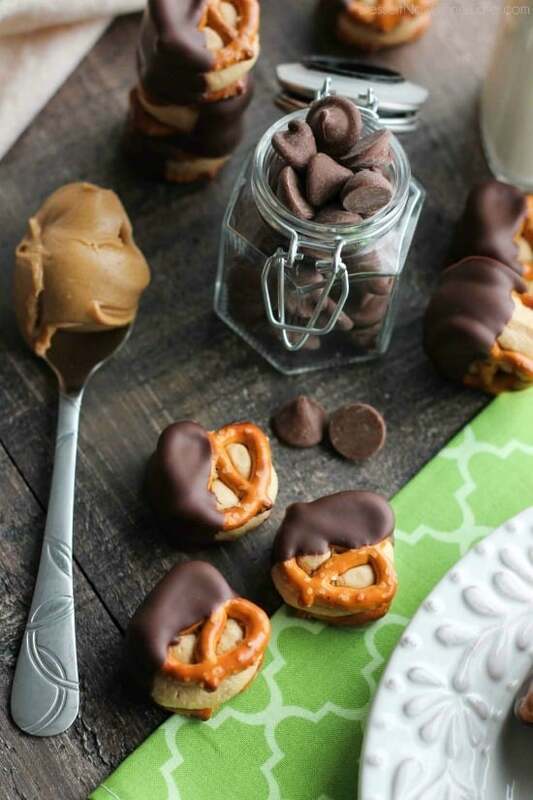 Peanut Butter Pretzel Bites. Yum! 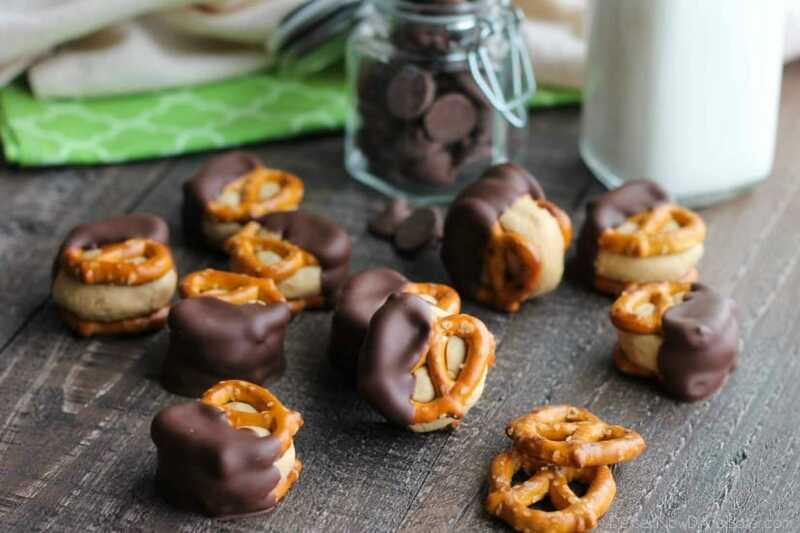 Pretzels add that little hint of saltiness that makes sweet treats even better. 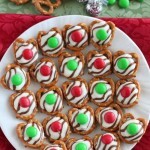 The pretzels also provide a great crunch factor. 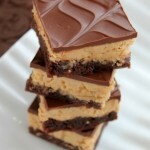 It’s almost like eating a sandwich cookie of pretzels, chocolate, and peanut butter goodness. 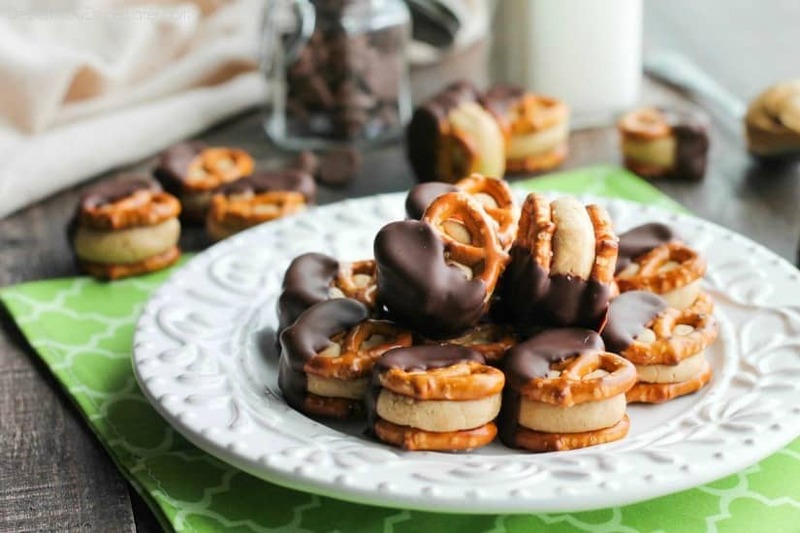 Peanut butter pretzel bites will become your next addiction, so be sure to share with friends. They will love you for it! Combine peanut butter, butter, vanilla and salt in large bowl. Beat with an electric mixer on LOW until blended. Add 2 cups powdered sugar, beating until blended. Beat in the last cup of powdered sugar until combined. Shape into 1-inch balls. Sandwich/squeeze each peanut butter ball between two pretzels. Place on baking sheets fitted with a silicone baking mat, parchment paper, or wax paper. Freeze for 15 minutes or refrigerate for 30 minutes. Place chocolate chips and coconut oil or shortening in a double boiler. (Or stainless steel bowl on top of a saucepan filled with water - make sure the water does NOT touch the bottom of the bowl!) Heat on medium-low until melted. 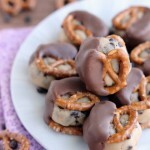 Dip pretzel bites halfway into the chocolate, shaking off any excess chocolate. Return to tray. 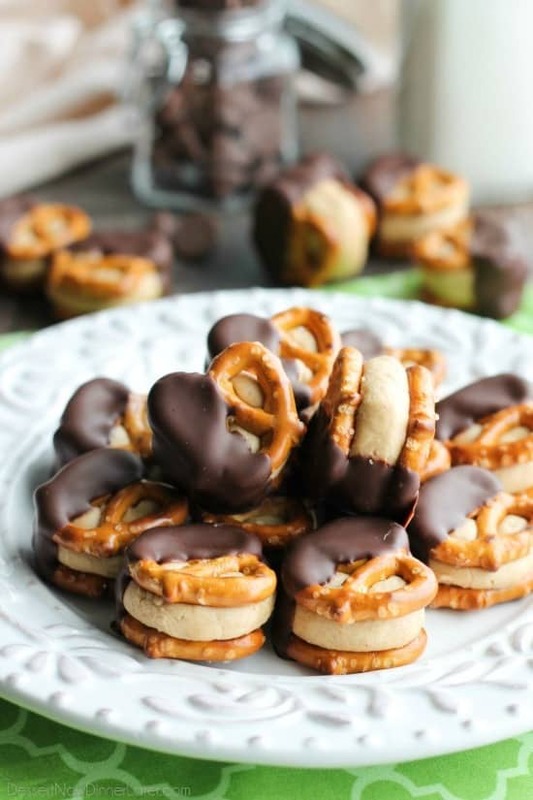 Repeat until all pretzel bites have been dipped in chocolate. Place tray(s) back into fridge/freezer until chocolate is set, about 15 minutes. Store in an airtight container in the refrigerator up to 7 days. 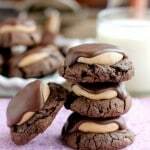 Altered from my Buckeyes recipe.